Dr. Kern Singh is skilled in treating spinal bone spurs, also referred to as osteophytes. Bone spurs are bony growths that form on the spine and can put pressure on nerves also causing numbness or tingling sensations in the hands and feet. Over the age of 60, bone spurs on the spine are quite common. Patients with Spondlylosis and Spinal Stenosis often get bone spurs, which can cause degeneration of or narrowing of the bones in the spine. 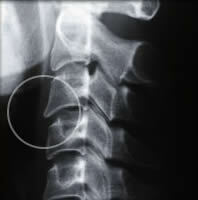 In most cases, bone spurs cause no symptoms and are found when an X-ray is done for another condition. However, symptoms can include: joint pain, loss of motion in the joints and numbness or tingling sensations in other parts of the body (arms and legs). Osteoarthritis is the most common cause of bone spurs. As osteoarthritis breaks down the cartilage cushioning between bones, the body attempts to repair the loss by creating bone spurs near the damaged area. Bone spurs can be genetic. There are several factors that can accelerate spinal bone spur growth including: Nutrition Life-style, including poor posture and poor ergonomics Traumatic forces, especially sports-related injuries and motor vehicle accidents. Electroconductive tests can determine the degree and severity of spinal nerve injury. X-rays can indicate the extent of arthritic changes and bone spur formation. Computerized tomography (CT scans) with myelography and/or MRI scans will help determine the degree of nervous system compression and any changes in the structure of the spine. A patient may have bone spurs present in the above imaging tests, but the bone spurs may not be the cause of the patient’s pain. Therefore, while the scans are a useful tool, they don’t necessarily provide a correct diagnosis. Non-surgical Treatment If bone spurs are causing pain, a physician may recommend over-the-counter pain relievers. Some patients with mild or moderate nerve compression and irritation from bone spurs can manage their symptoms with other medications, such as muscle relaxants. Rest and physical therapy may also help. Cortisone injections can help patients with facet joint inflammation by reducing the joint swelling. Bone spurs that limit range of motion or press on nerves, may require surgical removal. Surgical Dr. Singh may recommend endoscopic spinal foraminotomy if conservative treatment fails to provide relief.